a beaded silk, mohair glitter combination. We have tried to capture the elegance of this color of Artyarns Beaded Rhapsody on the page, but it's extremely difficult. This yarn speaks to you - and once you get it, you won't be disappointed. You won't have a hard time knitting it up, thought you don't have to - it's a beautiful piece of fibre without you doing a thing to it! 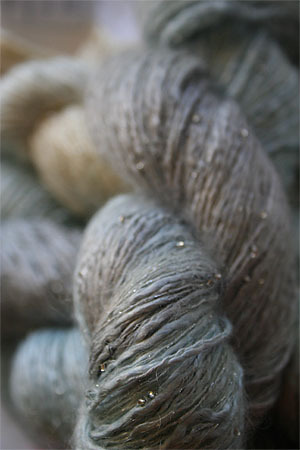 Artyarns are handpainted luxury fibers. To insure that your skeins are perfectly matched, your yarn may need to be custom ordered. Matched Lot orders will ship in 7-10 days and you will be notified of the delay when your order is placed!